They’ve planted corn on the cob outside the police station. They’re lettuces in rose beds. And tomatoes on waste land. 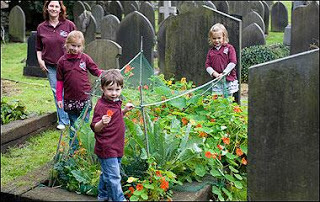 There’s even vegetables planted by school children in the graveyard. 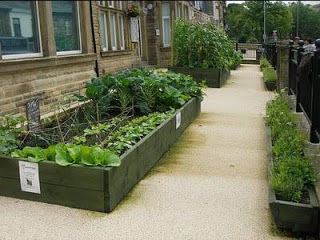 Incredible Edible, based in Todmorden is guerilla gardening at its best. The station master loved broccoli, so when he died, they planted broccoli all around the station. The station also has a free library. There’s no charge and no checking, but the number of books apparently stays the same. I heard a presentation from one of the founders and was inspired. I thought I was going to hear about a project that was good but not very exciting. In fact it was brilliant and very exciting. It would be great if we could have this approach to local food, all over the country. Anyone in the town can help themselves to raspberries, tomatoes, corn on the cob, beans, lettuce and lots more. And they’ll find this produce in strange places all over the town. Sometimes they’ve had permission and sometimes they haven’t but the scheme has become so popular that they’ve managed to get Council support – and lottery funding too. They’re also trying to be self sufficient in eggs – Every Egg Matters – so local producers are included in an egg map, telling people where to find them. Last week I was judging community green initiatives for a competition set up by Project Dirt, and sponsored by Timberland. There were a number of food growing entries, involving people from deprived backgrounds, ex-criminals, ex-alcoholics etc. They might not have known about Incredible Edible, but anyone who’s heard about it can’t fail to be impressed. I think this is what the Big Society is all about….. This entry was posted in BLOG, Cities & Towns, Communities, Done, Farming & Agriculture, Food & drink, News 2011. Bookmark the permalink.